EnglishRussia scanned some illustrations from a Russian version of The Hobbit. Very cool stuff, including this version of Gollum. At the bottom of the post are some video clips of a Soviet b-movie version of The Hobbit which you can miss except the last one which has their version of Gollum which isn’t to be missed. Ever wonder what it might look like if you combined the Tea Party anger at incumbency with Nordic politeness? Well, wonder no more! The Icelanders have created a new political party (the Best Party) and created their own music video. (h/t Foreign Policy) Of course, it’s not a perfect analogy…you won’t see any guns, pictures of Hitler or references to Chairman Mao but close enough. Yeah, keep trying to convince me that there are no such thing as the mole people. Sven talks about tactical agility. Steve Coll summarizes his lessons learned from blogging before taking an extended break to write a book. I’m not naturally inclined to write and so this exercise (now in its fifth year) has been a great experience. I think I’d find it valuable even if no one read this blog but it is also quite nice (and a bit humbling) to think of people deciding to spend their time on what I may have to say. Some things I did not expect that turned out to be true: 1) An awful lot of people read blogs. Spontaneously conceived essays (if they deserve that elevated name) that are not particularly well-thought-through can instantly go viral on you without warning. …That was a sobering discovery. 2) Goofy experiments that would not work in any other format, such as deciding to read the entire 2009 stimulus legislation and blog about it will be forgiven by many readers on the grounds that we’re all in this experiment together; it’s like going to a rock festival and hearing terrible music but feeling really good about being there. 3) Aggregation and calling attention to other people’s good work without much effort on your own part is enough justification for blogging in the first place. Some problems that I half-expected that also turned out to be true: 1) Writing fast about serious subjects because they are in the news, without doing a lot of reporting first, can produce crap. 2) Even the better instances of that sub-genre are still not very satisfying over time to the author. …This is just a blog post, however; I am free to revise my thinking in an hour, or whenever…and presumably no one will notice. Patrick Stewart was apparently just knighted…I wonder if he made the Queen’s clothes just drop off? Think this winter was tough on you? This week a number of ships were stuck in the Baltic Sea as unusual amounts of ice froze them in place. For those of you who aren’t familiar with the ferry system that crosses the Baltic it consists of a number of cruise lines that carry people and goods between the various nations that adjoin the Baltic. Most trips take from a few hours to an overnight and their big attraction is that passage on these ships entitles you to shop at the duty-free store on board. In fact, it’s not uncommon for people to take a short trip (they’re pretty cheap) solely for the opportunity to stock up on booze and smokes. And for short journeys, the ferries are pretty sweet. They’ve got a few restaurants, a (really, really) small area for limited gambling and entertainment. Well, I use the word ‘entertainment’ in its broadest and most general sense. There’s usually some sort of floor show which is usually just terrible. Imagine a Vegas show (and since I’ve never been to Vegas perhaps I should say ‘Imagine what you imagine I imagine a Vegas show would be like’) on a stage too small by half, choreographed by someone who’s an undergrad hoping to one day get a degree in dance (or whatever it is choreographers get their degrees in) and thinks he/she is the next -insert famous choreographer here since I don’t really know any- staffed by twice as many people as can comfortably fit on the stage and who are all mildly uncoordinated. Mix in costumes and generic music left over from the 70s disco era and viola! You’ve got a ferry line show. So take a moment, won’t you, to say a prayer for the poor unfortunates who’ve been stranded in the middle of the Baltic listening to countless hours of disco schlock. To all you Scandinavians out there. More about the holiday here and here. …politically neutral and entirely demilitarised, and residents are exempt from conscription to the Finnish Defense Forces. The place is frequently overlooked and known primarily as a stopping point for ferrys transiting the Baltic Sea. As I understand it, a brief stop at one of the islands two main ports allows the ships to sell items duty free and have gambling. That’s a shame because the islands actually have some interesting history. For example, Russia took the islands from Sweden in 1809 and began construction of a huge fortress complex called Bomarsund. Unfortunately for the Russians, the 19th century was a time of rapid technological change and the a joint force of British and French forces destroyed the incomplete complex as part of the Crimean War. You can see pics of the ruins here. …Lieutenant John Bythesea and William Johnstone, Stoker. Both went ashore from the Arrogant with the intent of stopping the mail flow from Bomarsund across Wärdö to the mainland. They lay in wait for three days until five Russians arrived on 12 August with the postbags. Johnstone ambushed the men, at Bythesea’s signal, attempting to throw a rope around the group whilst Bythesea provided cover with just one pistol. Two of the men dropped their bags and fled while the remaining three finally surrendered. Bythesea ordered the men back to their own boat and then forced them to row it back to Arrogant, with the mailbags. Trying to throw a rope around the group? Did this guy read too many stories about cowboys lassoing cattle in the Wild West? How great is that? If you like castles, Åland’s got one of those as well. The very nicely restored Kastelholm. (pics here). While Bormarsund is just a ruins, both sites are great for exploring and there’s good background information about each. I was only there for a bit more than 24 hours but the place looks fantastic for biking. Really well maintained bike trails are everywhere, there are a plethora of beautiful views and there are a variety of camping options (from B&Bs to tent sites to small cabins). The Norwegian state oil company decided it needed a themesong. Rather than go with the typical corporate drivel they attempted to do something hip and ended up with the following. I was a bit dismissive at first but the damn song is catchy so now I’m thinking I’m just jealous. I just finished this fantastic book by Jeff Janoda who took one of the Icelandic Sagas (specifically the Eyrbyggja Saga) and fleshed out the characters and plot to make it more palatable for us 21st century types. The story reminded me a great deal of a tragedy in the Shakesperean tradition where you have people of power to think they can shape their own destiny yet find that fate takes them down paths they could never have imagined (usually to terrible consequences). 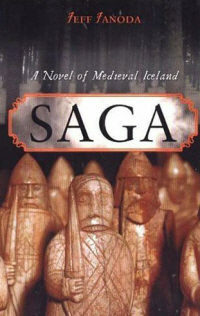 He tackles the difficult problem of explaining the numerous traditions and beliefs that ruled 10th century Iceland without drowning the reader in exposition or watering down the concepts to the point where the setting becomes generic. Most of the concepts are placed in a glossary in the back with the list of the dramatis personae in the front. In no time even the most unfamiliar names and similar sounding characters distinguish themselves as separate entities (not easy when you’ve got characters named Thorfinn, Thorgils, Thorleif, Thormod, Thorodd, and Thorolf). Usually, books I finish either are given away because I know I’ll never crack them open again or they might go back on the shelf with the intention to enjoy them again after the passage of time erases all but the general flow of the story. Rarely, I’ll finish one and want to start right back at the beginning because I enjoyed the story so much and Saga easily fell into that category. I’m not sure what (if anything) the author is working on next (his website is maddeningly out of date) but a sequel or retelling of another one of the stories would certainly worth while. Unfortunately, too many examples of literature that are cornerstones of our (or other) civilizations are being lost because they just aren’t accessible to the general population (the Iliad, Odessey, Aeneid, Beowulf, Canterbury Tales, etc., etc. etc.) but work like this can really help to make such works relevant to new audiences. Swedish culture coming to America! My wife was less than thrilled at the news of the show and I was a bit perplexed. So, after thinking about it a bit I decided to allow her to apply to be in the second season of the show. She was even less enthusiastic about that idea. These Swedes sure are an enigmatic lot. And what’s with the Norwegian getting into the ‘Swedish Mansion’. These Norwegians are getting a bit too big for their britches if you ask me. They’ve got tons of oil, celebrate their national day in Stockholm, and apparently they eat a lot of frozen pizza there…they’re like the Texans of Scandinavia!